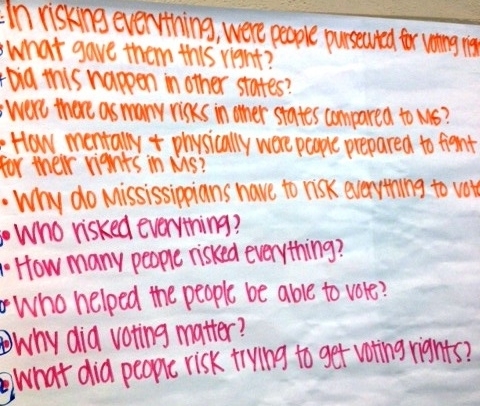 This lesson introduced students to the history, strategies, and challenges facing by people in Mississippi in their struggle for voting rights in the early 1960s. The lesson focuses on four cities in Mississippi: McComb, Laurel, Canton, and Hattiesburg. In small groups, students are provided confidential packets of documents for one of the four cities and assigned the role of either a voting rights activist or a member of the Sovereignty Commission. The students’ folders are filled with background information and primary documents. Many of the readings are from the Civil Rights Movement Veterans website. The format of the lesson draws loosely on the Historical Scene Investigation model. We welcome your feedback about what works and what doesn’t, students outcomes and comments, suggested edits and additions, and of course corrections. Send your comments to info@teachingforchange.org. Democracy demands that all voices be heard. People in Missisisippi have risked everything for the right to vote. Was Freedom Summer necessary to secure voting rights? Why hasn’t suffrage been universal throughout U.S. history? How do you fit into the story of maintaining voting rights for all in the United States? Five legal sized sheets of paper, one per group. Personal connections: Ask students to “write a paragraph about a time that a promise made to you was broken and/or a right that you had was taken away. How did you feel? How did you respond?” Have the students share using Think/Pair/Share. Explain that this lesson will explore the history of promises made and broken about voting rights in Mississippi. From Ms. Malone’s class in McComb, Miss. People in Mississippi have risked everything for the right to vote. Explain to students: You will learn about the history of the struggle for voting rights in Mississippi. This is in preparation for taking on the role of voting rights activists in the 1960s. Before you step into those shoes, you need to know what happened that led up to the challenges and opportunities you will face in the 1960s. This exploration of the history is done with two exercises: (a) a graphic organizer and timeline and (b) summarizing the history. Distribute one copy of “A Short History of Mississippi Voting Rights” to each student. What were the rights given in this time period? What were the causes of these rights given? What were the rights taken in this time period? What were the effects of these rights taken away? Model the creation of the graphic organizer for the first time period (Mississippi enters union in 1817 – end of Civil War) and then divide students into four groups to create graphic organizers for the remaining time periods. Post the flip charts in sequence and provide time for students to read the full timeline and discuss the similarities and differences between the time periods. Click for telegrams to share with students as examples. Students should stay in their same small groups. Give each group a legal size sheet of paper to summarize what happened with regards to voting rights in their time period. Explain that they will share this information in the form of a telegram (an old fashioned twitter) where you had to pay for each word and you can only afford 30 words. The telegram should communicate what promises were made and/or broken related to voting, at least one key date and event that their peers should remember, and one prediction about the effect of the event. If the students are not familiar with telegrams, share and discuss these historic samples. Then, model the creation of a telegram for the first time period. Once completed, have one student representative from each group stand and read the telegrams in chronological order. Then debrief. What do you notice about the history? What challenges do you think you will face as voting rights activist in the 1960s? Students engaged in this lesson in Ms. Malone’s classroom in McComb, Miss. History Detective Packets. There are many handouts to print the first time you use the lesson. We recommend making a full copy of all the handouts so that you do not need to download them from the website when you use the lesson again. Divide students into small groups. There should be a minimum of four groups and up to eight. Distribute one copy each of the Identity Sheets and “That Long Walk to the Courthouse” to each group. Note that there are two Identity Sheets for each location. So, if you have a small class, you can select one identity sheet to use from each location. If you have a large class, we recommend using both identity sheets for each location so that the groups remain small, ideally three to five students each. Ask the students to find where they are on the map on the “Long Walk” article. Then have them refer to the article’s description of their congressional district and make some predictions about their task. Will it be hard or easy? What obstacles will they face? Distribute the packets to the respective groups. Explain that some groups will be a civil rights worker and others will be a Sovereignty Commission supporter. Ask, does anyone know what the Sovereignty Commission was? If they don’t, explain that it was an agency created by the state government to spy on and undermine the Civil Rights Movement in Mississippi. To help provide students with the context they need for the activity, we developed a brief Mississippi State Sovereignty Commission that you can use. Have the students distribute the documents in their packets among their small group. They can take time to read silently. When you think the groups have had a chance to read the contents of their packet, suggest that as a group, they create a list of everything they know about what is happening in their respective location. Explain, since you don’t know who the other groups are, be sure to keep your packets and conversations confidential. Remind them that some people in the room are informants for the state government. Therefore, groups might want to talk quietly so that the Sovereignty Commission members do not overhear you. Likewise, the Sovereignty Commission informants do not want everyone to know what they are doing or their ability to secure information will be compromised. Once students have generated a list of what they know about their location, ask them to take on the assignment on their respective Identity Sheet. Note that some of the assignments may need further explanation from you as you circulate to the groups. Over time we hope to add samples of the writing assignments as a reference for students. Once the groups finish their writing, have them turn them in to you to prepare for the next activity. Have students remain in the same county groups from the previous exercise. However, let the students know that they are now traveling to the future, to the year 2060. They are working as historians researching the history of Mississippi. Not much of the history was preserved, so they only have access to two documents in each team. Distribute the student generated assignments to the groups, but not the group that wrote them. For example, Laurel looks at the “assignments” from Canton; McComb looks at the “assignments” from Hattiesburg, etc. Ask students to write, in their groups: What is similar to the community where you worked? What information seems to be missing? What questions do you still have for the other community? In the large group, have each group pose their questions to members of the other groups. Discussthe discoveries and insights. Study contemporary voting rights opportunities and obstacles, such as voter ID laws, gerrymandering, and the rights of the current and formerly incarcerated to vote.